A sensible sounding policy needs the structure to support it. For a newly elected government, there is nothing more difficult than trying to sketch out a grand, overarching policy idea ahead of time. Without any track record to go by, even the most well thought-out proposals can start to sound vague and lofty, reinterpreted by both supporters and detractors alike to suit their own political views. Think of Chinese President Xi Jinping’s Chinese Dream, which means political and economic reform for some and a stronger, nationalist military for others. And when rhetoric outpaces the reality on the ground, it only invites criticism and constrains implementation. The U.S. “pivot” to Asia looked far more promising before TPP negotiations began to stall, threatening the much larger promise of balanced engagement with the region. This predicament would have likely been on the minds of Julie Bishop, the Minister for Foreign Affairs, and Andrew Robb, the Minister for Trade and Investment, as they launched the government’s economic diplomacy agenda on April 18 at the Lowy Institute. The term “economic diplomacy” has been frequently used by Bishop in particular since the Coalition government came to power. Economic diplomacy is front and center in most of the minister’s big foreign policy speeches and often makes an appearance in her talking points. Less clear is what it actually means. The easiest way to grasp the concept is to look at what it aims to achieve. The Department of Foreign Affairs and Trade (DFAT) defines four key pillars: promoting trade, encouraging growth, attracting investment, and supporting Australian businesses. All of these goals have to varying degrees played a major role in Australia’s foreign policy. Economic diplomacy is best seen as an attempt to tie these loose ends together into one common thread. On the lofty side of things is the belief that Australia’s prosperity depends on the growth and vitality of the global economy. 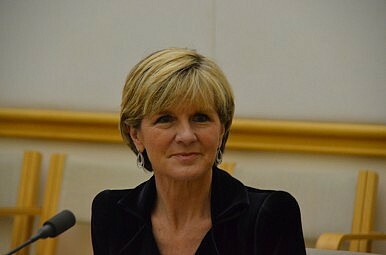 “If the goal of traditional diplomacy is peace,” Bishop suggested, “then the goal of economic diplomacy is peace and prosperity.” On the practical side is a recognition that Australia owes much of its recent economic success to liberal and open markets, broadly favorable business conditions and strong ties with the world’s most innovative and dynamic economies. In her speech, Bishop describes economic diplomacy as an “overarching principle that puts strong economic outcomes at the centre of our foreign, trade, investment, tourism and development assistance policies.” If that seems like a fairly accurate reflection of what most countries do most of the time, it’s because it is. The difference perhaps has less to do with the outward-focused goals and more with the internal changes taking place. Economic diplomacy is seen as a way for reorganizing the government’s approach to foreign policy. This points, of course, to the key predicament at the heart of economic diplomacy: is the government able to follow through effectively in implementation. In terms of size and geographic reach, Australia has the smallest diplomatic footprint of any G20 nation and following the merger with AusAID, DFAT has experienced considerable staffing cuts. Even as the department has achieved notable wins of late with free trade agreements with Japan and South Korea, for instance, recent research suggests that Australian exporters are failing to take advantage of the gains FTAs provide and that a “knowledge gap” exists amongst Australian businesses. Dealing with these more intractable everyday challenges is often just as important as securing big trade deals or introducing new initiatives. Although Bishop envisions a much more prominent role for NGOs and the business community, ensuring economic diplomacy as an “overarching principle” has a credible “overarching structure” will be crucial. Giving the department the resources and space necessary to lead a long-term whole-of-government approach was probably the most important point left out of what is an otherwise smart and sensible policy shift.